Spot unauthorized visitors. 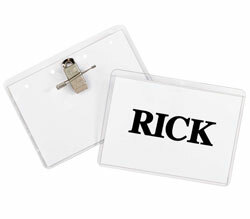 These easy to use self-expiring badges are ideal for visitor control. Highly visible color spot indicator signifies badge expiration. Identifies trespassers up to 50 ft. away. Time's Up! One-Day Spot Badges reveal a bright red VOID notice after one day. To activate Time's Up!One-Day Spot Badges, simply adhere the two parts together. Do not apply to vinyl, leather, suede, corduroy or silk. 100/BX. Can be customized with your logo. Contact us for details.